Every time I write, I think about my readers and what would they want to read. When I have a post, I think about what would my audience search for if they were looking for an article like mine. The secret always lies in the title. Is it the sort of thing your readers would actually search for? Are you using their words? It sounds so obvious now, doesn’t it? So once you’ve figured out part of the title you need to make sure it really GRABS their attention! 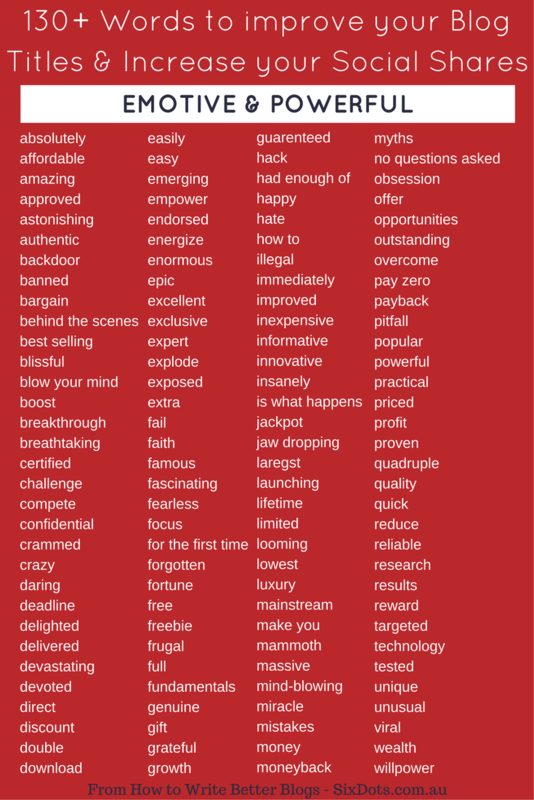 Finally – Make sure to include some words or phrases that pique your readers interest! So think about what YOUR readers really want. What problem are you trying to solve. We writers really want to connect (so drop me a line or a comment and let me know how I’m doing – info@sixdots.com.au). Getting the title right is so important because once people read it they will decide, based on that one line, whether they actually want to read what you have written. If they do read it and it really resonates with them….they will share it and then their friends will read it… Social shares are the currency we trade in, we want to be heard and our words to be read. 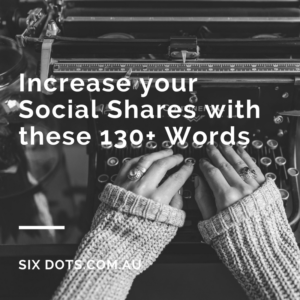 So here’s a great list of 130+ words and phrases to increase your social shares and get your blog read! This is part of my Writing Better Blogs Series, so I would really recommend having a look at some of the other articles in this series. How to post content your readers will love to share!